The new hardcover edition of The Stardust Kid comes out this Wednesday from the fine folks at Archaia. 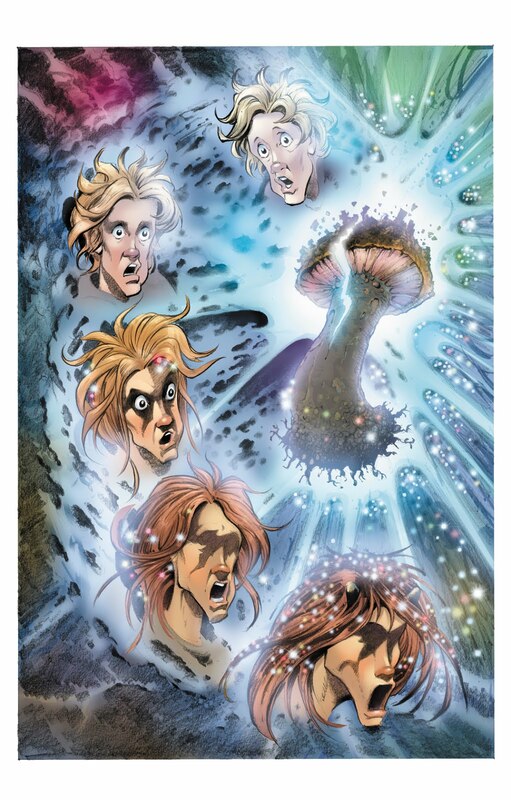 Along with the five issue series illustrated by the legendary Mike Ploog (with amazing color by Nick Bell and Sumi Pak), it also features pitches, pencils, scripts, character designs and a new introduction by yours truly, which you can read below. Enjoy! Stories, as I’ve often observed, have lives of their own. They’re living, breathing, independent entities and no matter how a writer may coax and cajole, sweet-talk and seduce, he can never truly control a story and he certainly can’t force it do something it doesn’t want to do. They’re stubborn beasts, these tales, and, hard as this is to admit, they’re always right. Each story also has a unique timing: like a human being, it needs to gestate in a womb (in this case, the womb of the unconscious, of the creative self). The difference is that we generally know when a human is ready to be born: stories, on the other hand, can leap, full-grown, into the world overnight or take their sweet time coming to red-faced, squalling life. And the writer, poor fool, is like a 1950’s sitcom father, pacing in the hospital waiting room, wondering when the nurse will come bursting through the door with word of his child’s arrival. That waiting can sometimes take decades. Case in point: The Stardust Kid. The idea started brewing in my head in the early 1980’s when my son Cody was a toddler. I was living in a very rural area of upstate New York and, as the story began forming in my head, it became a way to mythologize our family’s life there, to reveal the magic and miracles at the heart of the everyday world, and, especially, to pay tribute to my son (renamed Cody DiMarco for the story) by making him the protagonist of an epic fantasy-adventure. All these years later, I’m not sure what form The Stardust Kid (the title was there right from the start) first took—I may have planned it as a children’s book—but its first complete form was as a screenplay: a Spielbergesque fantasy. My agent at the time took the script out and we had a few wonderful rejections—yes, there are such things—as well as some serious interest that, ultimately, led nowhere (welcome to Hollywood). Disappointed, I tucked SDK away, not knowing if I’d ever return to it. By the late 80s, my career in comic books was going strong and—perhaps reacting to the grim and gritty, “adult” sensibility that gripped the industry then—I became intrigued by the idea of doing comics geared for children and parents: not adaptations of popular cartoons as was the norm, but (inspired by the books Cody and I devoured together, especially the Oz and Narnia series we both adored) a smart, beautifully-illustrated comic book that mirrored the best in children’s literature. I’d just finished Moonshadow—a real breakthrough for me as a writer—and I wanted to take the lessons I’d learned crafting that series and apply them to a kid-friendly story. By the late-nineties my interest in doing comics for children had blossomed into an obsession. The atmosphere in the business had, so I thought, shifted. Thanks to the emergence of the independents and imprints like DC’s Vertigo, the parameters of what a comic book could be had broadened in the readers’ minds, so I decided to pitch an entire children’s line to a variety of publishers. If memory serves, I came close with Marvel, but they were going through some seismic business shifts at the time and our talks collapsed. Rather than continue beating my head against that particular wall, I decided to focus my energies on getting one single kid-friendly comic book into print. That comic was, of course, The Stardust Kid. Actually, it wasn’t. It was another kid-friendly fantasy with the hard-to-pronounce title of Abadazad, which, in 2003, I sold to the short-lived but well-remembered publisher, CrossGen. The behind-the-scenes Abadazad saga could fill a lengthy introduction of its own, but I’ll spare you those details and focus on the artist of that series: a genius illustrator, a master storyteller, named Mike Ploog. Working with Mike on Abadazad remains one of the highlights of my professional life. Our collaboration was enchanted from the start: we understood each other, shared a creative vision of what those stories should be, almost instantly. I’d been carrying Abadazad around in my head for at least a decade before Mike came on board, but, once he did, it was impossible to imagine that universe without him. To have the opportunity to collaborate with an artist I’d admired when I was just a wide-eyed fan was truly a gift from the comic book gods. That Mike turned out to be such a splendid, and infinitely entertaining, human being was the icing on the cake. When CrossGen collapsed beneath our feet (I told you it was quite a saga), Mike and I found ourselves confused, depressed and hiring lawyers to try and get our property back, a process we knew could take years. Creativity, I’ve always said, is the best revenge, so we decided to launch a new project, a new world, to fill the void Abadazad left in our hearts. And I had just the thing. I emailed Mike a more recent incarnation of my Stardust Kid screenplay (I’d been playing with the story on and off over the years), he gobbled it up and, applying a story-sense honed by years in comics and film, gave me invaluable feedback that helped me shape what was now our story in new, and better, ways. Even more valuable were the astonishing character designs Mike started barraging me with—visions that had been floating in his head for as long as SDK had been floating in mine—hoping I could somehow weave them into Cody DiMarco’s tale. Many, perhaps most, of those Ploog Creatures never made it into the book, but what they did do was inspire and excite me, helping to create a visual map for the Kid’s rich fantasy world. As we’d done with Abadazad, Mike and I began refining our main characters—I’d write descriptions, he’d whip up designs and we’d bat those back and forth, molding and shaping Cody, Paul, Alana, the Dark Woman and the rest of our magical cast. I put together a proposal, which we pitched along with Mike’s beautiful sketches, and, with surprising swiftness (y’know, if you discount the preceding twenty-plus years of development), the project was sold and we got to work. Labor had finally started, the long-gestating baby was about to be born and I was one happy father. When the five-issue mini-series was done, our first collected edition was edited by a young Boom! Studios employee named Cody DeMatteis. The cosmic symmetry was as mind-boggling as it was heartwarming: here was my son, the toddler who sparked The Stardust Kid’s long and winding creative journey, now fully grown and leaving his imprint on the story he’d inspired all those years before. It’s enough to make you believe in miracles. And the magic of story. I hope that magic fills your heart and soul as you read the tale that follows. About Scoobs Apocs' new issue. After seeing their Christmas tree, I can't decide if I am happy , or deeply disappointed there was no Charlie Crown line thrown in. If you recall, I didn't know if that was good or bad. Wait, I thought Ploog drew Frankenstein in the 70s. As for my real question, well is WAS, whether or not you recall if you rote Steve Rogers and Captain America as different in demeanor. Formed by my recent purchase of a Marvel Team Up you wrote. Recent times have seen the word "realism" become a dirty word among comics. Even a current comic pro has said as much. The problem is that realism is a not necessarily a word everyone has the same definition for when when it comes to being applied to the fantastical. What is your view? Your definition? Because, in the end, the definition is what matters to the answer. (at least he did back in my era): have a lover, a group of friends that are just average people, etc. But he's not someone who becomes something Other when he puts on a mask. As for the realism question: For me, no matter how fantastical the setting, what I aim for is psychological and emotional realism. That is, there are recognizable human beings, struggling with recognizable human issues, at the core of the story. Doesn't matter if you wear capes and tights or are swept off to an enchanted fairy land. You need real, relatable people at the core of your story. And that's the realism that matters to me. I think the lines have gotten even more blurred since they retired the idea of Steve having a secret identity. It wasn't so much them being different people, as it was certain elements got played up more when Steve was in costume. Now, keep in mind, I read your Cap run a wile ago, and this is based off of one MTU comic. So, who knows how accurate that theory of mine is. Yeah, that is my feeling as well. I think it is most peoples, it is as I said about the person's definition. I think the backlash against the word "realism" has potential to be problematic. I don't think many people want to go back to Superman in the Silver Age, where had had no real personality, fears, or emotions. Of course the creator in question, who does have a habit of being very thoughtful, seemed adamant against Superman ever failing in any way. In the end of the day, I think people as a whole and regardless of age, race or gender, have sort abandoned nuance. Not in the ability to think (well not always) but in statements. Those rascally Canadians. Power and responsibility, that is what it all comes down to. Great introduction - how cool is that full circle? Happy Holidays to you and yours over yonder! Happiest of holidays right back at you! And, yes, the full circle thing is VERY cool. Great story of the story... with a so sweet ending! Thanks, Ken! Hope all's well! I pre-ordered this month ago, based on either a post or reply you made back then. It gets shipped to me later this week, and I expect to get it the week of Christmas. I'm looking forward to reading it. I'll be sure to let you know what I think. Oh, and I also am expecting to get a copy of "Ubik" for Christmas (another book you recommended I read). I'll read SDK first for sure, but I'll let you know what I think of each. Ploog is an incredible artist, so I'm excited to see how you two collaborated together. Thanks so much for supporting the work, George! VERY much appreciated! Hope you enjoy it...and UBIK, too! So I finished both The Stardust Kid (the new Archaia edition) and Ubik this week. I wanted to let you know my thoughts on each book. 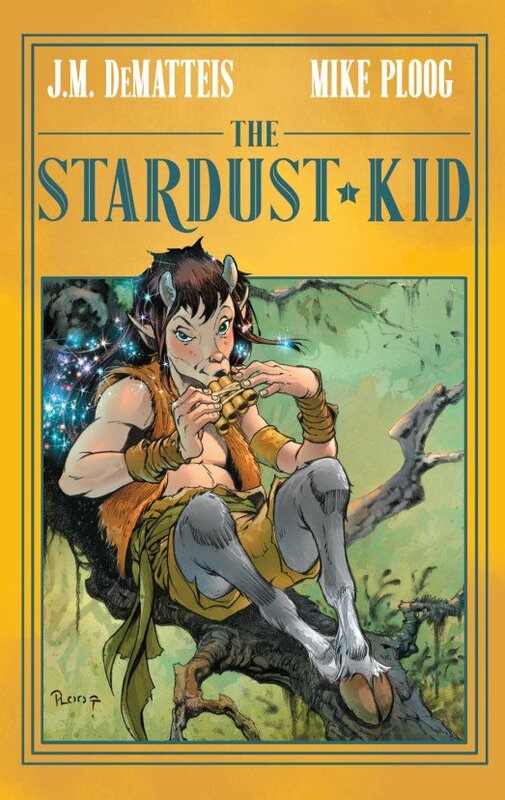 (1) The Stardust Kid collected edition is incredible. I have to start by saying I never read the series when it was originally published. It was something I've heard about from interviews with you, and reading comments on your site, but I never personally read it. After reading this edition, I have to say it works perfect as one collected edition. The story is uplifting and imaginative. It's reminiscent of all my favorite children's fantasy stories (The Never Ending Story, Wizard of Oz, Labyrinth) but certainly has enough depth and humor for the adult reader (not many children's fantasy tales use the word "brobdingnagian"...are you a Gulliver's Travels fan too?). I knew the story was going to be good and knowing Mike Ploog was doing the art, I was sure the art was going to be good, but what really got my attention were the colors and the lettering. I've never seen such styles before. It made the whole book just POP! I loved it. Archaia spared no expense on paper quality, and the hard cover really made the book feel sturdy and special. This is one of the nicest collected editions I've ever seen. It was also great that they didn't make the book over-sized. It's the same size as a comic and fits on my shelf or in a comic book box perfectly. I am sure you got a few copies of it. Don't you agree it's beautiful? I just love it. (2) Ubik. When we discussed Blade Runner months ago, you asked if I ever read the source book "Do Androids Dream....". I told you I did and I didn't like the book (still don't). You asked me to read Ubik. I was hesitant, because even though I like PDKs story ideas, I am not a fan of his execution of those ideas. You strongly urged I read Ubik, and I did. It was actually great. I knew after three chapters I was going to like it and by the end I really loved it. I don't want to spoil the little twists for anyone else reading this who hasn't read it, but they were there and they were unexpected. It was great. Even though there were still the PDK moments I find dull and repetitive (the little Ubik advertisement at the beginning of each chapter) it didn't diminish the story as a whole for me. It was the best PDK book I ever read (I've read three) by far. Thank you for recommending it. VERY happy you enjoyed the new SDK edition, George. I'm so happy with the way it turned out. And, yes, the color (by Nick Bell & Sumi Pak) and the lettering (by Ed Dukeshire) are incredible. Equally glad you enjoyed UBIK. I've read it a number of times over the years and it remains my favorite PKD story. Hurray! Another UBIK convert. Now read A SCANNER DARKLY. And THE THREE STIGMATA OF PALMER ELDRITCH! I will give one of those a shot.